2 Years of travelling in a caravan and 2 laps of OZ and we are hungry for more! We have had so many people ask us why we haven't settled down yet and aren't we sick of it? The absolute honest answer is HELL NO! The last 2 years on the road has been the most amazing time of our lives, and what we have learnt is that it gets in your blood......Australia is a massive country with so many diverse landscapes. 2 years of travel has only just scratched the surface. The best part of our last 2 years on the road is that it's instilled an adventure bug in our whole family! We now strive to find more remote, more EPIC and more surreal campsites around Australia and the good part for you guys is that we photograph and film our experience and bring them straight to you through our online platforms. The new Summit Winch Bar & Intensity lights looking the goods on the Mazda! The Big news for 2018 is that we are gearing up for more OFFROAD ADVENTURES!! 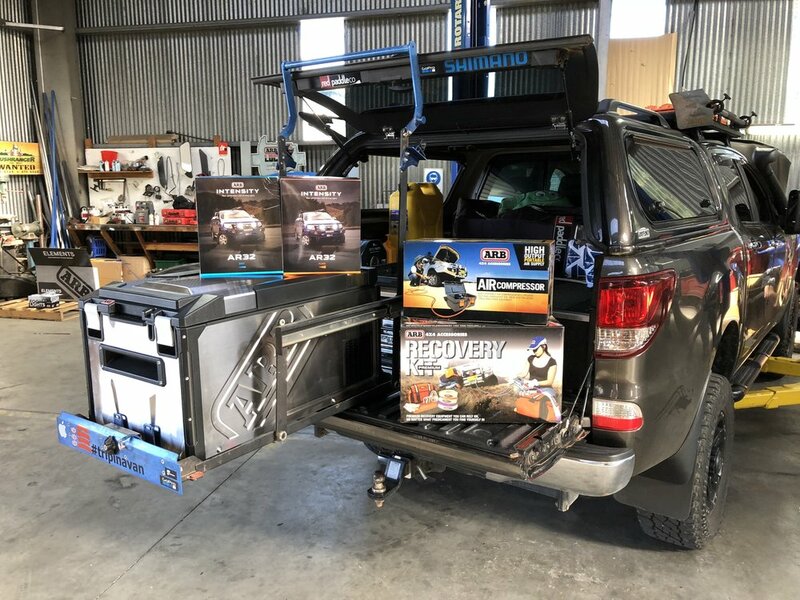 We have teamed up with ARB 4x4 accessories and kitted out our BT50 touring rig with some extra gear to tackle some tough remote tracks around OZ. This includes a Summit Bullbar, Warn Winch & Recovery kit. AR32 Intensity driving lights, high output compressor for airing up after those tough tracks and a brand spankin new ARB 60litre Elements fridge!! We have chosen to fit the Summit bar & Warn winch as we always travel on our own. There has been a lot of times in the past where we haven't attempted a track because we were worried about getting stuck and not being able to recover ourselves to keep going......No more worrying about that now!! We will be testing out this gear and providing video reviews and blog articles along the way. What do we love about ARB gear and accessories? The big thing for us is that all their products come from years of research and development in Australian conditions. They are built to handle what us Ozzy blokes throw at them and they back it up with a replacement warranty and a nationwide dealer network. It doesn't matter what state you're in or what regional outback town, there is always an ARB dealer or stockist that can help you out if need be! I learnt this the hard way!!! As a mechanic i thought i would kit my rig out myself.. The actual work and fitting the components itself wasn't an issue, but after only 3 weeks of fitting a 2" lift kit that i bought off EBAY (reputable brand name components), i went to change my rego from NSW to QLD and both front shocks failed the safety inspection!!! Trying to get them repaired was an absolute nightmare and i ended up taking the ute into ARB Maroochydore to fit an Old Man Emu 2" lift kit. Why did we go this way?? Well after the first kerfuffle of failed suspension, it got us thinking? What if this had happened when we were in a remote location? How would we get warranty or repairs? We can't go for days on end without a car.... So after a lot of research and for our own peace of mind we got the ARB Old Man Emu kit fitted and haven't looked back! "Poor Man Buys Twice" is a good phrase that comes to mind. 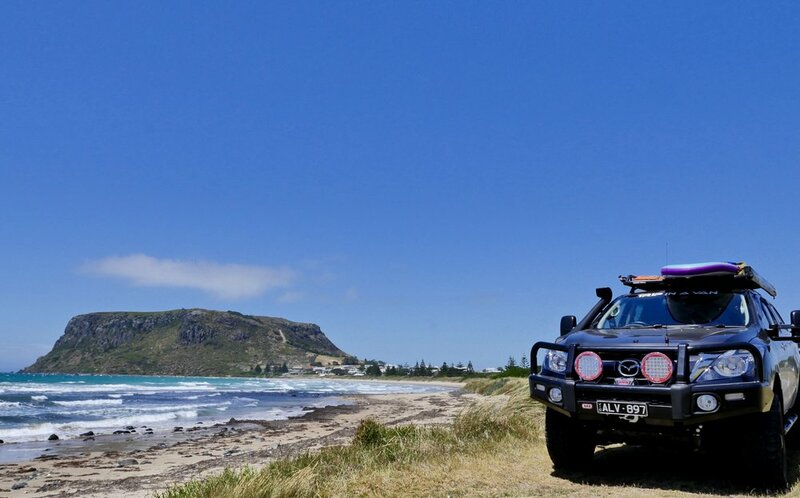 After years of experience and hearing countless stories from other families - there is no substitute for quality when it comes to 4wd, camping and caravanning equipment! We want gear that we can rely on! Gear thats going to stand up to the tough stuff when we're out on the tracks using it!! No point having a product that looks fantastic, yet it leaks like a sieve in the first rain you get or fails as soon as you hit some decent corrugations. Camping with the family is all about enjoying the outdoors, and the better the quality, easier to set up and more convenient your kit is, the more fun your family will have! I can tell you that from experience! Big things this year. Heaps of travel, loads of 4x4 and camping and some great events and stories throughout the year. Exciting stuff for us and we hope you all follow along and enjoy all of our footage. We strive to put out great info that will inspire others to get out there and enjoy all the of the same great places that we do. Our Jurgens Caravan has taken us around OZ twice!!! 70,000km of trouble free touring - Bloody stoked with that!! Online store for all things caravanning!!! THE AIR BNB OF CARAVANS - HIRE YOURS OUT WHEN YOUR NOT USING IT AND MAKE REAL CASH!! !